PawSox to "Celebrate Rhode Island" in 2019 by thanking fans for "50 years together"
The Pawtucket Red Sox today unveiled a year-long series of initiatives to thank Rhode Islanders as they begin their 50th year of partnership with the Boston Red Sox and their penultimate year at 78-year-old McCoy Stadium. Pawtucket's minor league team first became a Red Sox affiliate in 1970 (Double-A). In 1973, the club rose to the Triple-A level. In "Celebrate Rhode Island: 50 Years Together," the PawSox, in conjunction with the defending World Champion Boston Red Sox, will present in 2019 initiatives and charitable projects to the fans who have steadfastly supported a host of Red Sox players for five decades. 1. "Kids Free" Monday-Friday Nights in April & May: To demonstrate their appreciation specifically to youngsters, the club will welcome all kids, 12 and under, free at every game, Monday nights through Friday nights, in April and May. 2. "Swing into Summer" Returns in June, July, & August: To demonstrate their appreciation to Rhode Island school children from kindergarten through 12th grade, the club will bring back its popular "Swing into Summer" program, in which all students in the state who successfully advance to the next grade level at the end of the school year receive a free ticket to a choice of several summertime games in June, July, and August. The long-standing program had been dormant for four years. 3. "PawSox Rhode Shows" throughout the Ocean State: To demonstrate their outreach throughout the state this year, the club will present a traveling "PawSox Rhode Show" that will include baseball instruction from players, as well as mascot visits, music, and souvenirs. The club welcomes public officials from each of the 39 cities and towns to request the visits, as well as the participation of the club to help meet a particular community need (such as bringing cheer to seniors, reading to children, or providing socks and other warm clothing), as the club seeks to render 50 "Acts of Kindness" to the communities of Rhode Island. 4. A "Commitment to the Community" to Continue Charitable Programs-including the successful PawSox Mentoring Program-long-term in Pawtucket and Rhode Island: To demonstrate their appreciation to residents of the state, regardless of their passion for baseball, the PawSox and the PawSox Foundation commit to continue to contribute to the community long term, including their PawSox Mentoring Program, a partnership with Mentor Rhode Island. Since 2017, PawSox front office members, from Club President Dr. Charles Steinberg on down, have served as mentors to young students at Agnes Little Elementary School. The staff members visit the children at school each week and also host them at events at McCoy Stadium. This past week, the protégés (or mentees) attended a lunchtime Celebration of the 100th Birthday of Jackie Robinson, interacting with Red Sox Hall of Famer Tommy Harper and new PawSox Manager Billy McMillon. 5. A "Win-Win" for Pawtucket: Although the PawSox do not currently project to generate a profit from the 2019 season, if they should do so, they have agreed to split those profits 50/50 with the City of Pawtucket. "These are welcome good deeds from an organization that has been good to our city for five decades," said Pawtucket Mayor Donald R. Grebien. "We will be collaborating with the PawSox to continue to do what's best for Pawtucket and for Rhode Island." 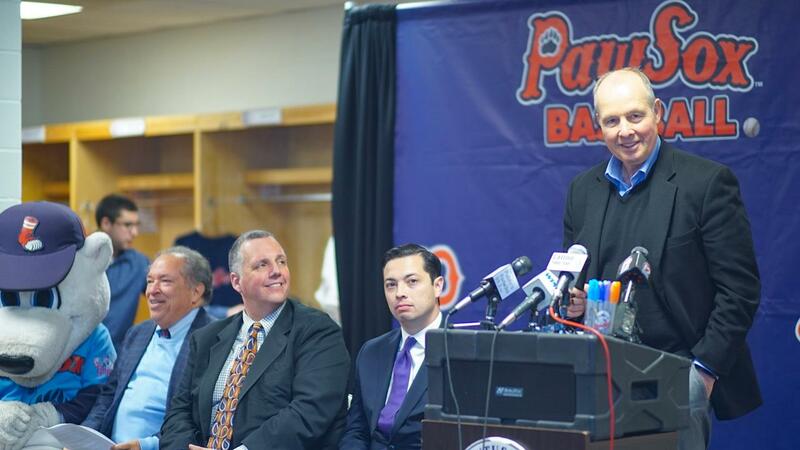 "We recognize the range of emotions pouring from our passionate fans, and we seek to connect with them in a meaningful way," said PawSox Principal Owner and Chairman Larry Lucchino. "In our remaining two years at McCoy Stadium, we are creating new initiatives to make it even easier for families to enjoy PawSox Baseball and to ensure that children have undeniable access to the ballpark. And in 2021 and beyond, when we play at the other end of the Blackstone Valley, we intend to continue to support the vital charities of Pawtucket and Rhode Island-for we are one region united in a love of the Red Sox." "I am very proud that the PawSox' commitment to the community will continue long into the future," said PawSox Vice-Chairman Mike Tamburro, who this year begins his 46th year with the club. "Larry Lucchino and I recognize the important role of this club and our foundation to the charities that have come to depend on us. When it comes to our contributions to the community, we are here to stay." "The PawSox' partnership with Mentor Rhode Island is one of our most rewarding programs," said Steinberg. "Many of us in the front office treasure our mentorship with students across the street at Agnes Little Elementary. We have watched our children grow up from third grade to now fifth grade, and we look forward to those weekly visits. We intend to continue this program, as well as so many of our other community initiatives, in the years ahead." The club will continue its recent tradition of presenting Fireworks every Saturday, and this year will tie its record set last year with 13 fireworks nights overall, including patriotic shows July 1, 2, and 3. The PawSox will collaborate with the Boston Red Sox to present special "Legendary Fridays" that honor the players, the moments, and the championships that both clubs have enjoyed throughout the 50 years. The 2018 World Champion Boston Red Sox comprised 44 players-35 of whom played at some point in Pawtucket. Manager of the Year Alex Cora also played for the PawSox. More such initiatives will be announced at a later date. Fans can see the latest news about "Celebrate Rhode Island: 50 Years Together" at pawsox.com/50.